The 'Field Rankings' page has been enhanced with new metrics for strokes gained, DraftKings and scoring average. This page is available on the 'Predictions' menu in the member section of Golf Predictor. As shown in the image above, six new options have been added to the 'Metric' dropdown list on the 'Field Ranking' page. These metrics are for total strokes gained, strokes gained tee to green, strokes gained putting, DraftKings salary, DraftKings average points per game and season scoring average. That brings the total number of metrics on this page to 29. There is also a new chart link along the top of the data table, which shows the top performers for each of these new metrics graphically. Note that in relation to the new metrics added, the strokes gained information and charts are not available prior to week 14 of the 2016 GP season. In relation to the DraftKings information and charts are not available prior to week 24 of the 2015 GP season. Also, the DraftKings and strokes gained metrics are only available for US PGA Tour events and you may have to refresh the page to see the changes. 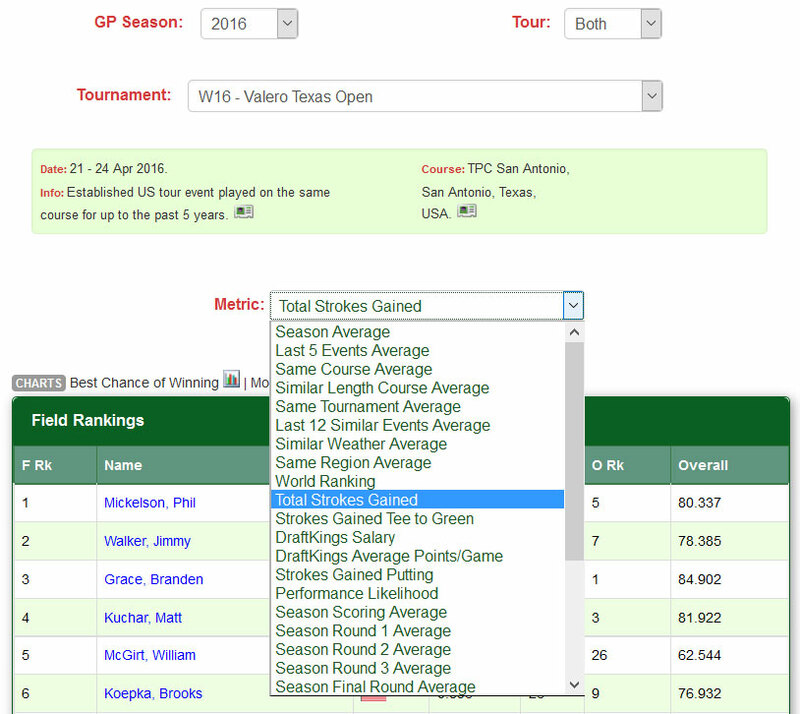 Non-subscribers can only see the new season scoring average chart and those golfers with field rankings in a given metric from 11-25 and also ranked between 11-25 in the GP rankings. Therefore, sign up today and reap the full benefits of Golf Predictor, the premium professional golf statistics site. The predictions and statistics for this week, the Volvo China Open (European PGA Tour) and the Zurich Classic of New Orleans (US PGA Tour), are now available on Golf Predictor. No big names are teeing it up in China this week and the tournament is being held on a new course this year. Neither of these facts make it very easy to call, but Joost Luiten will be hoping to build on his recent great form. There are a few big names playing in Louisiana, where world number one Jason Day and two other members of the world's top ten headlining the field. Soo-min Lee (ranked 31st by Golf Predictor) won the Shenzhen International on the European PGA Tour. The 22 year old South Korean won his first tour title with a two shot win over Joost Luiten and Brandon Stone. Despite throwing away a five shot lead earlier in the week, Lee bounced back in style to win in only his sixth start. In the leading pack with three holes to go, Lee birdied the sixteenth and made a terrific eagle on seventeen to exorcise the demons of Malaysia from two months ago. Our top ranked player, Bubba Watson, finished strongly again this year, closing with a 66 (-6) for tied 8th. Overall, we had eleven of the top nineteen plus ties (11/23) in the weather affected event, which finished on Monday. 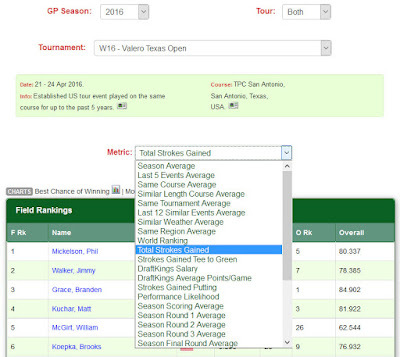 Charley Hoffman (ranked 10th by Golf Predictor) won the Valero Texas Open on the US PGA Tour. The 39 year old American won his fourth tour title after a series of weekend capitulations in recent months. Hoffman improved on his impressive course record by getting up and down from a bunker at the last to beat Patrick Reed by a shot. Our top ranked player, Branden Grace, finished well for tied 9th and we had ten of the top twenty one plus ties (10/24) in total. The predictions and statistics for this week, the Shenzhen International (European PGA Tour) (European PGA Tour) and the Valero Texas Open (US PGA Tour) are now available on Golf Predictor. Not a great field in either event this week, but at least there are six of the top twenty in the world teeing it up in Texas. After a full week on European soil, the European Tour heads off to China, where once again, Bubba Watson has taken the trouble to fly half away around the world to headline the field! Andrew Johnston (ranked 54th by Golf Predictor) won the Real Club Valderrama Open de Espana on the European PGA Tour. The 27 year old Englishman won his maiden tour title with a one shot victory over Joost Luiten on the demanding Valderrama layout. Johnson (+1) became the first golfer with an over par winning score in a regular European tour event in 20 years as the weather and the course made scoring difficult. Our top ranked player, tournament host Sergio Garcia, rallied after a poor start to finish in third place and we had twelve of the top nineteen plus ties (12/25). Branden Grace (ranked 6th by Golf Predictor) won the RBC Heritage on the US PGA Tour. The 27 year old South African won his his first tour title with an impressive final day performance on the testing Harbour Town layout. Grace finished with a fine 66 (-5) to win by two over British duo Russell Knox and Luke Donald. Our top ranked player, Jason Day, rebounded from a disastrous Saturday performance to finish tied 23rd. Overall, we had only seven of the top fourteen plus ties (7/22) in the tricky conditions. The predictions and statistics for this week, the Real Club Valderrama Open de Espana* (European PGA Tour) and the RBC Heritage (US PGA Tour) are now available on Golf Predictor. After the excitement of The Masters, it's back to the grind this week! While most of the big names are resting after the exertions of Augusta, there are several big names playing in South Carolina. Not least among them is world number one Jason Day, where fans will have plenty of time to admire his play! Meanwhile in Europe, the rank and file will be chomping at the bit in Spain after a three week hiatus from normal tournament play. This year's tournament is being held on one of the best courses in Spain at Valderrama and Sergio Garcia is headlining and hosting the event. *The verbose full name is the Real Club Valderrama Open de España, hosted by the Sergio Garcia Foundation! Danny Willett (ranked 9th by Golf Predictor) won the first major of the year, The Masters (European/US PGA Tour). The 28 year old Englishman won his first major after the dramatic collapse of the defending champion, Jordan Spieth. After a fairly unexciting first 63 holes, the tournament came alive on the back nine on Sunday when runaway leader Spieth bogeyed the tenth and eleventh holes before quadruple bogeying the short twelfth. That calamity catapulted Willett into the lead and the Sheffield man finished with aplomb to take the title. Spieth made a mini comeback and had a chance to catch Willett with a strong finish, but it was not to be. An emotional Willett took the title just a week after welcoming his first child into the world. Had the baby arrived on time, Willett would not have played at all! Our top ranked player, Jason Day, didn't fire on all cylinders, but still finished in tied 10th place. Overall, we had nine of the top seventeen plus ties (9/20). 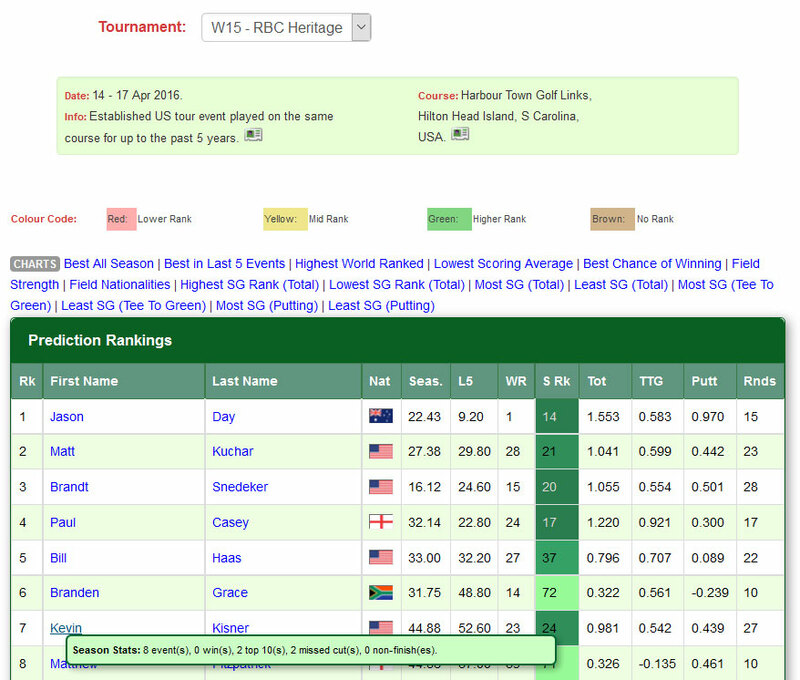 The predictions and statistics for this week, The Masters (European/US PGA Tour), are now available on Golf Predictor. Only one tournament this week, but it's the big one! It's that time of the year again and excitement is mounting among golf fans ahead of the first major of the season at Augusta. It's wide open this year with many top players showing good form ahead of the tournament. It promises to be an exciting week's golf and I, for one, will be glued to the TV!